On August 22, 1976, the Vidyadhara The Venerable Chögyam Trungpa Rinpoche formally empowered Ösel Tendzin, as his Vajra Regent, dharma heir, successor, and lineage holder in the Karma Kagyü and Nyingma traditions of Tibetan Buddhism. Trungpa Rinpoche bestowed upon him the name Karma, Moon of Dharma, Excellent Intellect, Radiant Holder of the Teachings, Victorious in All Directions. The Vajra Regent was the first Western dharma student to hold these lineages. His Holiness the Sixteenth Gyalwa Karmapa, the head of the Karma Kagyü lineage, during his 1977 visit to the United States, confirmed Trungpa Rinpoche’s appointment of the Vajra Regent as a lineage holder. At the time of Trungpa Rinpoche’s passing into parinirvana, His Holiness Dilgo Khyentse Rinpoche, head of the Nyingma lineage, reconfirmed the Vajra Regent as Trungpa Rinpoche’s lineage holder and empowered him with the highest Maha Ati abhisheka, giving him the name Lord of Yogins, Coemergent Accomplishment Vajra. The Vajra Regent Ösel Tendzin was born Thomas Frederick Rich, Jr., in a working-class family in Passaic, New Jersey, on June 28, 1943. Popular and bright throughout his grade school years, he attended Fordham University in New York City, graduating in 1965. Subsequently he worked as a physical therapist in New York and Los Angeles while studying yoga with Swami Satchidananda. He first encountered Trungpa Rinpoche in 1971 in Boulder, Colorado, and made an instant and strong connection with him. He asked to study with him, and later that year Trungpa Rinpoche asked him to be his dharma heir. That same year he moved to Karmê Chöling in Vermont, where he married Lila Irene Zimmermann, and the first of their four children was born. In 1973, he was appointed to the first Vajradhatu board of directors and was later appointed executive vice-president of both Vajradhatu, Trungpa Rinpoche’s organization of meditation centers, and Nalanda, his group of educational institutions. After his empowerment in 1976, the Vajra Regent Ösel Tendzin taught extensively throughout North America and Europe. In 1977, when Trungpa Rinpoche went on an extended retreat, he left the management and primary teaching responsibilities of Vajradhatu in the hands of the Vajra Regent. 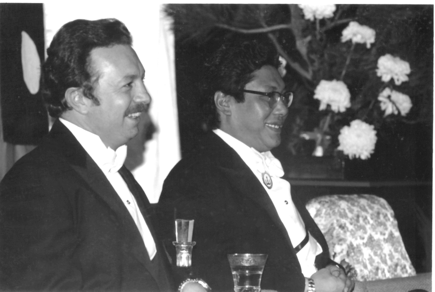 Trungpa Rinpoche and the Vajra Regent worked closely together on many projects, including co-founding the Shambhala Training Program. In addition to his teaching and administrative duties, the Vajra Regent also practiced dharma art, including calligraphy, poetry, and photography. For many years, Trungpa Rinpoche had indicated his intention to relocate the headquarters of Vajradhatu and Shambhala Training to Halifax, Nova Scotia. In 1985, the Vajra Regent and his family took up residence in Nova Scotia. He guided the sangha through this transition, as well as through the difficult period following Trungpa Rinpoche’s passing into parinirvana in 1987. As lineage successor, the Vajra Regent became the president of Vajradhatu. From Halifax, he traveled around the United States and Canada visiting many Dharmadhatus, urban meditation centers of Vajradhatu. He then presided over the 1988 Vajradhatu Seminary, a three-month intensive study and practice program for advanced students. During that seminary, the Vajra Regent became gravely ill. Having sought the guidance of one of his beloved teachers, His Holiness Dilgo Khyentse Rinpoche, head of the Nyingma lineage, he entered into retreat in Ojai, California, for what was to be the remainder of his life. During that retreat, he formally empowered Patrick Sweeney, Trime Lhawang, as his dharma heir and lineage successor. Mr. Sweeney and a small group of close students remained on retreat with the Vajra Regent and received further instructions in the dharma and on how to proceed after his death. The Vajra Regent gave his final teaching, a dialogue with his close students on the practice of the yidam Vajrayogini, in August, 1990. Shortly afterward he entered a hospital in San Francisco. On August 25, 1990, he passed into parinirvana. The body of the Vajra Regent rested in samadhi, during which time traditional signs of realization appeared. After three days his body was taken to Rocky Mountain Dharma Center in Colorado for the cremation ceremony. At its conclusion, a vivid double rainbow appeared, spanning the sky. He is survived by his wife, Lady Lila Rich, and their four children. His lineage successor, Patrick Sweeney, carries on the leadership of the sangha in Ojai where the Vajra Regent established his seat. The Library & Archives project is part of the non-profit work of Satdharma. Our 501 c3 Federal Tax ID # is 77-0511391.